We’re delighted to be partnering with Kent based Simpsons English Wine Estate to introduce two amazing English wines to our customers. This fine English sparkling wine reflects the exquisite characteristics of their iconic, chalk terroir in the North Downs of Kent. This is the first sparkling wine to be released from the Simpsons’ outstanding inaugural harvest. Created from estate grown Pinot Noir grapes, this traditional method rosé is the essence of English taste and luxury. Delicately pink with a fine mousse and soft, rose petal and fresh strawberry sorbet nose, it has a creamy, rounded texture with crisp red berry flavours and a refined finish. The Simpsons’ Wine Estate Roman Road vineyard is situated on the sunny, sheltered slopes of the North Downs of Kent. Exuding a true sense of place, the Roman Road Chardonnay is elegant and linear, with a distinctive mineral quality that you would expect from fruit grown on these iconic chalk soils. Created from fruit carefully selected for its maturity and concentration, this single vineyard, still white wine displays aromas of honeysuckle and white melon, with smooth rich flavours of macadamia and vanilla pod. 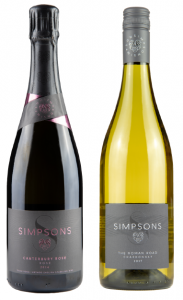 Simpsons Wine Estate has 90 acres of vineyards situated on the sunny, sheltered slopes of the North Downs and anchored in the iconic, free-draining, chalky soils so highly revered in the world of sparkling wine. In 2016 a state-of-the-art winery was created in Barham in preparation for their first harvest and their elegant Glass House tasting room was completed during 2017, complete with a helter skelter slide.